Mark Williams during his match against Sheffield's Adam Duffy. Mark Williams could cap off an amazing 2018 by being crowned snooker’s world No 1. 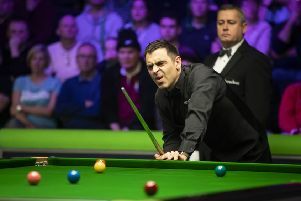 The 43-year-old completed one of sport’s most stunning comebacks in May by winning his third World Championship – 15 years after his last Crucible title. The Welshman became the oldest world champion since 45-year-old Ray Reardon lifted the trophy in 1978. But six months on and Williams is a week away from ending Mark Selby’s near four-year reign – 46 months – as world No 1. While Williams eased past Sheffield’s Adam Duffy in his first-round match at the Betway UK Championship at the York Barbican, Selby – world No 1 since February 2015 – suffered a huge upset, losing to Blackpool amateur James Cahill. It means if Williams can win next Sunday’s final in York – pocketing £170,000 and a third UK title – he will overtake Selby and go top of the world rankings for the first time since 2011. It would be an amazing achievement for the Welshman – he plays Daniel Wells in his second-round match today – who had considered retiring from the sport before his 2018 renaissance. Not that Williams himself places much kudos on the world rankings. “It’s something I’m not interested in whatsoever,” said Williams. “We all know who is the best player in the world (Ronnie O’Sullivan) and he just doesn’t enter as many tournaments. “To be honest, I don’t even want it. I’ve been practising so little I don’t even know if it’s still the same carpet in my club. “If I don’t win another tournament I’m happy – it’s still going to be a party. “This will probably be my last tournament of the year so I’ll try to have a good run. “The last few months have been a bit of a party for me. I’m going on holiday in December and then when I get back before the Masters I will have to knuckle down and get back to normal,” he added. 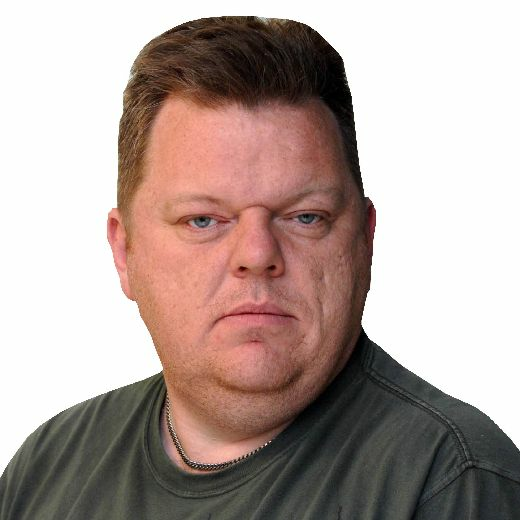 While the likes of fortysomethings Williams, O’Sullivan – who is 43 next week – and John Higgins continue to lead the field, they are joined in the second round in York by local cueman 47-year-old Paul Davison. The potter from Pickering is the only Yorkshireman to emerge after a harsh opening first round at the Barbican. Davison – who first turned professional in 1992 – beat Grimsby’s Stuart Carrington 6-1 to clinch his place in the televised stages. He has already had some eye-catching wins this season, beating Scotland’s Stephen Maguire 4-1 at the European Masters, and Alan McManus 5-2 in the World Open. Now ranked 89th in the world – his highest ever ranking was 70th back in 2012 – Davison has been forced to fight for his snooker career, battling through Q School on three separate occasions to regain his professional status. Davison faces a tough second-round test tomorrow, when he meets Chinese teenager Yan Bingtao, who is based in Sheffield, and trains at the Steel City’s Victoria’s Snooker Academy. Of the seven Yorkshiremen who started out in York, only Davison remains for the weekend. While Williams ended the hopes of Sheffield’s Duffy on Thursday evening with a 6-2 defeat, York’s Ashley Hugill lost out 6-5 to Iran’s Hossein Vafaei. Father and son Peter and Oliver Lines – from Leeds – also fell at the first hurdle. Peter was edged 6-3 by Rory McLeod in a late-night finish on Thursday, while son Oliver suffered a 6-2 exit to the experienced Graeme Dott. Joining Davison in the second round is Ding Junhui – an adopted Yorkshireman, the 31-year-old Chinese star having lived in Sheffield since he was a teenager. Ding plays world No 60 Matthew Selt tomorrow. 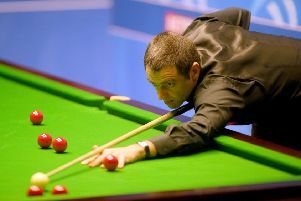 The biggest shock in the opening three days in York, though, was the surprise defeat of Selby. The three-time world champion was beaten 6-3 by Cahill – a 22-year-old who was only handed a place in the 128-man field as one of the leading ‘top-ups’ from the Q School ranking list.